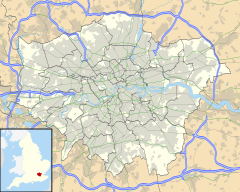 Forest Hill is an area of the London Borough of Lewisham in south London. Like much of London, Forest Hill was only sparsely populated until the mid-19th century. The name Forest Hill, originally simply "The Forest", referred to the woodland which once covered the area and which was a part of the Great North Wood. ↑ "Lambeth Ward population 2011". Neighbourhood Statistics. Office for National Statistics. Retrieved 13 October 2016. This page was last changed on 27 February 2018, at 17:15.